Did you know that Gosport’s only Pétanque play area is at Stokes Bay? 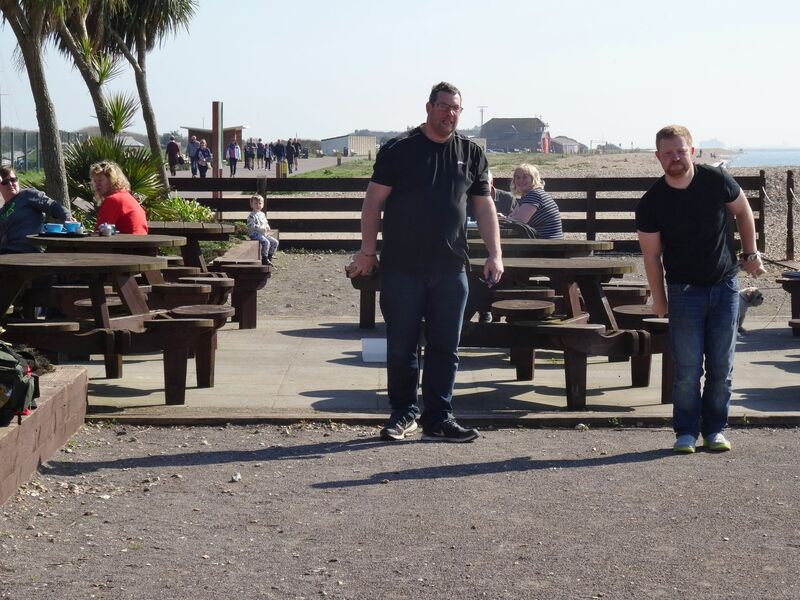 You will find two play areas next to the flower beds (maintained by the Friends of Stokes Bay) alongside the Bistro Cafe and bar. It was constructed in 2009 as part of the commemoration of Gosport’s link to its twin town of Royan in France. 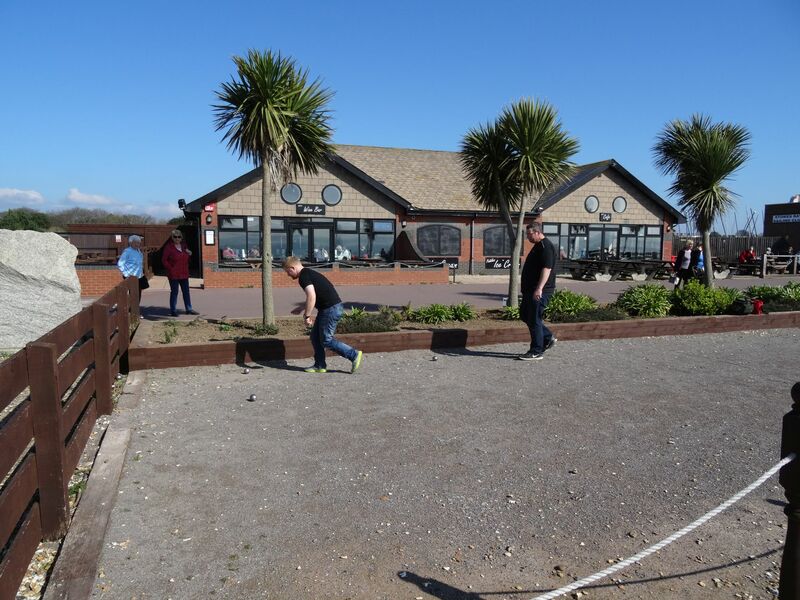 Watch this space; Some FOSB members have asked about forming a Pétanque Club! Pétanque is also known as Boules and is played outdoors on any reasonably firm surface: your yard, the park, a field, a gravel parking lot, cinder running track, etc. Hard surfaces like concrete or asphalt or very soft like a fine sand beach or long grass are not recommended. The best surface is hard packed earth. If there are a few bumps and hollows that’s fine and can even add more challenge to the game. Both teams select their boules. Each team’s boules should have Groove Patterns that distinguish them from the other side’s boules: that way, they will be easy to identify when counting up points. 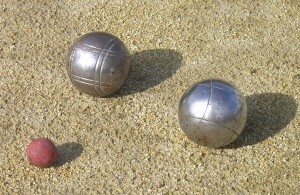 When playing Singles or Doubles, each player uses three boules and for Triples each player uses two. Perhaps Toss a coin to see which side goes first? All boules must be thrown from within the starting circle and with both feet on the ground. The player attempts to throw the boule so that it lands as close to the jack as possible it is okay to hit the jack. The player must remain inside the circle until the boule has landed. A player from the opposing team then steps into the circle and attempts to land his boule closer to the jack even if it means knocking his opponents out of the way. The boule closest to the jack leads or is said to be “holding the point.” The other team must continue throwing boules until they take the lead or run out of boules. 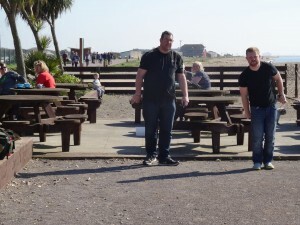 There is no order that team members must follow when throwing their boules however, they must only throw their own boules, and they must go one at a time from within the starting circle. If they take the lead, the other team then tries to recover by landing a lead boule. Once the points are counted, the next round begins with previous round’s winners drawing a new starting circle. This starting circle is drawn around the final position of the jack in the previous round. The winning team then selects a player to toss out the jack from this new starting circle and then throw out the first boule.